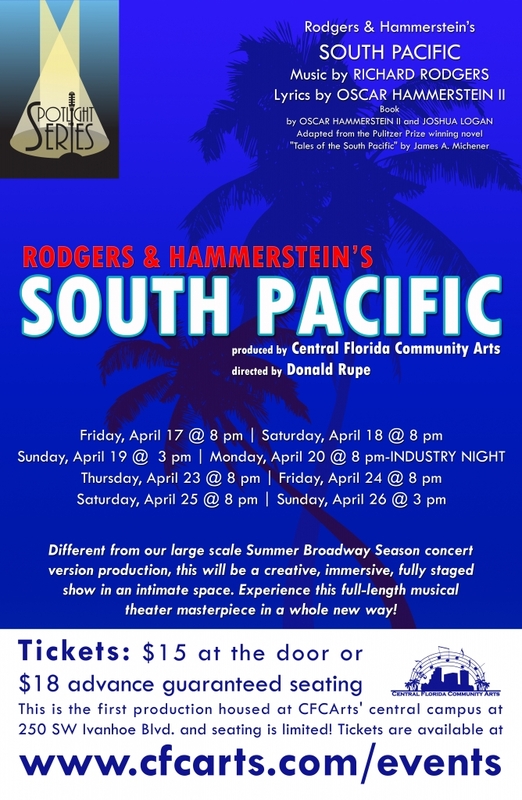 CFCArts is proud to present South Pacific as its Spotlight Series show for April! This epic musical romance centers on a group of American sailors and Navy nurses stationed in the South Pacific during World War II. One of the world’s classic and most beloved musicals, Rodgers and Hammerstein masterfully weave together beautiful stories of love and war through such unforgettable songs as “Some Enchanted Evening,” “There is Nothing Like a Dame,” and many more. Seating for all South Pacific shows is limited and advanced purchase is strongly recommended. Guaranteed seating can be purchased in advance for $18 (credit card/Paypal) or, if available, can be purchased for $15 at the door (cash/check only). Tickets for Industry Night are just $12! Doors open 30 minutes before showtime and all seating is general admission. This production contains mild adult themes and language.